Eimear Burke, Chosen Chief-Elect of OBOD, lives in Kilkenny, Ireland. 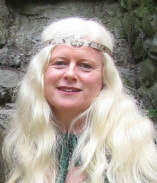 She founded the Kilkenny Druidry College with her late husband, Howard Campbell, in 2010, and runs residential and day workshops on druidry, healing herbs, wild food for the soul, bread making, labyrinth walking, and various other topics. Eimear holds an MSc. in Counselling Psychology from Trinity College, Dublin. She works in private practice as a counselling psychologist, Reiki & Seichem master, Shamanic therapist & herbalist. She is also a celebrant and a teacher. Eimear has a deep love of the ancient Irish tales, and therefore has a passion for storytelling. She brings the old tales to new audiences, and, while remaining faithful to the stories, often examines them from new perspectives, so that listeners experience them as fresh and relevant. She particularly enjoys showing people the sacred sites of Ireland and telling the ancient tales right where they happened. Eimear's keynote address will be Trees and People Intertwined: A Talk on the Ancient Tree Laws of Ireland (see Workshops). Susan Jones, former OBOD Mentor Co-coordinator and 2019 Mt. Haemus Award scholar, returns for our fifth anniversary! Susan joined us at our inaugural Gulf Coast Gathering in 2015, and we are delighted to have her back for 2019 as she previews for us her progress on her Mt. Haemus talk! Susan will speak on ​What Druidry Does: A Perspective on the Spiritual Dynamics of the OBOD Course (see Workshops).